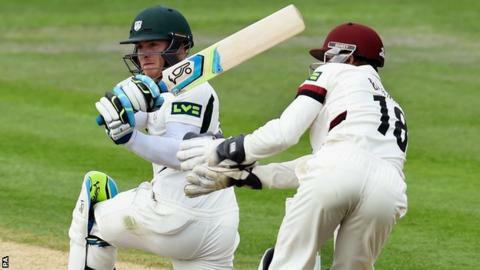 Worcestershire wicketkeeper Ben Cox hit a career-best 109 to help his side build a useful first-innings lead of 152 over Somerset at New Road. Resuming on 35-2 in reply to Somerset's 250, Worcestershire batted all day before being bowled out for 402. Winter signing Alex Gidman made 78, his first half century for the county. Cox, making only his second County Championship ton, shared a seventh-wicket stand of 168 with Joe Leach, who fell just short of a century on 95. Gidman was in charge throughout the morning session as the home side added 98 for the loss of Daryl Mitchell (27) and Alexei Kervezee (29). When Gidman was then out, having smashed a short ball from Craig Overton to point, Cox was already on 38. Somerset have won three and drawn three of their last six County Championship games against Worcestershire, having lost six of the preceding seven meetings. After three previous failures this season, including two ducks, Cox had found his touch with an unbeaten 48 in Worcestershire's defeat by Sussex at Hove. And the local product continued to play positively, cutting loose in partnership with Leach after tea until he offered a return catch to Lewis Gregory. Leach looked set to follow him to three figures, but the need to speed up in pursuit of a fifth batting point caused him to carve a catch to point. Having been stuck on 398-9 after 110 overs to miss out on that extra batting point, Sachithra Senanayake was then out with just two scheduled overs left for the day. That allowed Peter Trego to claim his third wicket in support of Alfonso Thomas, who finished with 4-82 in his first game after injury. "I've felt good since Hove and made a couple of technical adjustments. Thank goodness it worked. "It will be hard work getting wickets. We've got to bowl straight and hope the pitch does a bit in the first hour." "As a bowling group you have to maintain discipline. If you stick to line and length, there is something in it for you."